Due to the rapid expansion of construction industry in the past decade which arisen from both government and private sector’s mega and medium projects establishment such as factory, building, office, residence, express way and bridges to facilitate all type of vehicles, the demand had exceeded supply and caused the shortage of construction materials especially high quality concrete beam. 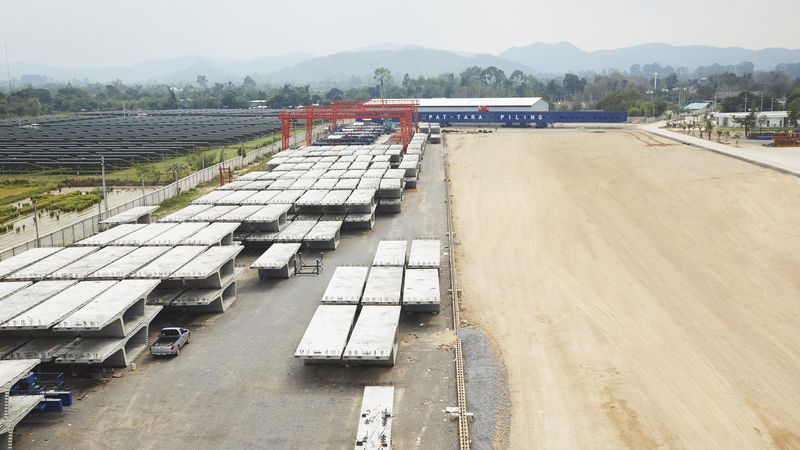 PAT-TARA PILING COMPANY was founded in 1989 with 20 million baht registering captial to manufacture and distribute stressed concrete products such as high quality I type concrete beam which is the strong and secure foundation of all constructions to serve the increasing market demand. The factory locates at Pathumthani-Banglane road side with 86 rai area. PONG-PAT ENTERPRISE COMPANY was founded before 1976 but was stopped in 1994 to let the PAT-TARA PILING COMPANY solely operate the business. In addition to more market expansion of the stressed concrete business, the company has been reconducted. The business has been divided into 2 groups. PAT-TARA PILING COMPANY manufacture and distribute stressed concrete such as beam, plank girder, box girder and box segment. PONG-PAT ENTERPRISE COMPANY manufacture and distribute big size stressed concrete such as Prestressed concrete I & C girder and Post tension I & C girder to general contractor of government job located in the same area. Both companies have separated production jobs into 2 teams under the supervision of experienced and high vision professional executive management team including specialized experts for planning and operation. We have improved and developed products quality all time with production standard that monitored every details start from the beginning until the end of production process together with our experienced and high skilful experts supervision for the best quality products output. With our intention to produce advanced products with high quality and have enough potential to support construction industry efficiently, our company has planned for expanded investment. This enables us to serve various construction projects more efficiently in terms of quantity and standard quality. Technology is advancing rapidly these days, however, we also have improved, rectify and developed technology to be applied for production continuously. This pushed us to become experts in beam and stressed concrete beam that can be used in our research for production system planning in the future. 32/2 MOO 3 PATHUMTHANI-BANGLANE RD.